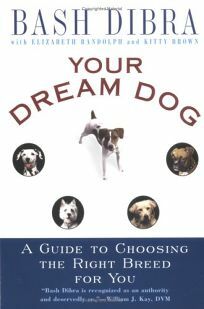 This guidebook by an animal behaviorist to the stars (including Sarah Jessica Parker and J-Lo) helps readers with the all-important decision of selecting the right dog breed for one's lifestyle, circumstances and personality. Dibra's goal is for pet owners and the pets themselves to be utterly satisfied with the relationship, because""when the wrong one moves in with you, nobody--including the dog--is happy."" With cautionary anecdotes of what can happen with the wrong dog, and encouraging stories of perfect matches, he introduces readers to the five-point temperament test, which can be used to pick a specific dog, then provides basic information--size, breed history, height, weight, life expectancy, exercise requirements and potential behavior problems--on more than 160 breeds, from Affenpinscher to Yorkshire Terrier. He also provides tips on where to find one's dream dog, how to get the relationship off to the right start and how to keep the animal healthy.